Most newspapers now have an online presence for their current issues, but gaining access to their archival holdings is more difficult. And payments are often required. Listed below are some sources for historical newspapers which are freely available, though sometimes with certain conditions. The British Newspaper Archive is a collection of digitised newspapers from the British Library, drawn from the period 1700 – 1950. The project is ongoing and publications from the 19th century have been the most extensively covered in its early stages. Among the titles now available are the Berwick Advertiser, the Berwickshire News and General Advertiser, the Alnwick Mercury, and several papers published in Newcastle. Northumberland Libraries provide free access to the database, but the content of articles can only be viewed on library computers, by registered users. Log in from their Online Resources page. The indexes can be searched on the web without restriction. Welsh Newspapers Online, hosted by the National Library of Wales, is a ongoing digitised collection of more than 100 newspaper titles, in English and Welsh, drawn from the 19th and early 20th centuries. Titles can be searched simultaneously. The Times Digital Archive is a digitised edition of the full text of The Times newspaper, from 1785 (until a rolling date about 5 years ago). Available from many public library services. (Not currently offered by Northumberland Libraries / Active Northumberland). The Gazette is the UK’s official public record with a publication history dating back to 1665. It comprises the earlier titles of the London Gazette, the Edinburgh Gazette, and the Belfast Gazette, among others. Among the information relating to individuals, it includes references to insolvencies, wills, and awards and honours. The Internet Library of Early Journals contains limited runs of six 18th and 19th century publications. It is hosted at the Bodleian Library and includes the following: Annual Register (1758-1778); Blackwood’s Edinburgh Magazine (1843-1863); Gentleman’s Magazine (1731-1750); Notes & Queries (1849-1869); Philosophical Transactions of the Royal Society (1757-1777); The Builder (1843-1852). The Nineteenth Century Serials Edition is a digitised collection of short runs of six journals/newspapers: Monthly Repository (1806-1837) and Unitarian Chronicle (1832-1833), Northern Star (1838-1852), The Leader (1850-1860), English Woman’s Journal (1858-1864), The Tomahawk (1867-1870); The Publishers’ Circular (1880-1890). The British Colonist (subsequently The Daily Colonist), published in Victoria, British Columbia, is available in a full-text online edition for the years 1859-1920. For other resources, see the list of links provided by Library and Archives Canada at: Canada News Online. Trove, created by the National Library of Australia, is a digital repository of Australian information sources. It includes the full text of more than 1000 newspaper titles, from the early 1800s to the 1950s (with a few titles covering more recent dates). It is one of the most extensive newspaper archives that is freely available online. Papers Past, at the National Library of New Zealand, is a digital collection covering over 130 NZ newspapers, covering the years 1839 to 1948. New material continues to be added to the collection. 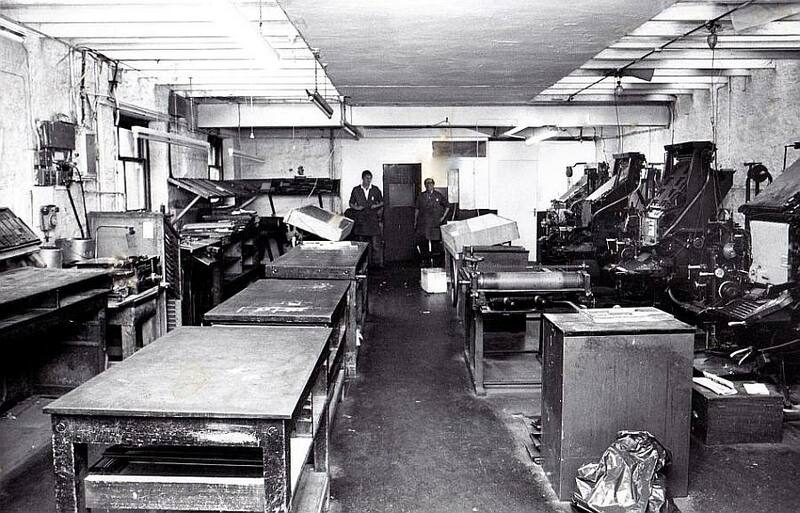 Berwick Advertiser composing room 1960s. Photo: © Colin Whillis. The Berwick Record Office holds copies of local newpapers on microfilm.